The loss or decline of a loved one is always an emotionally wrenching experience. Having to deal with their finances as well in this already difficult time can seem like an overwhelming burden. 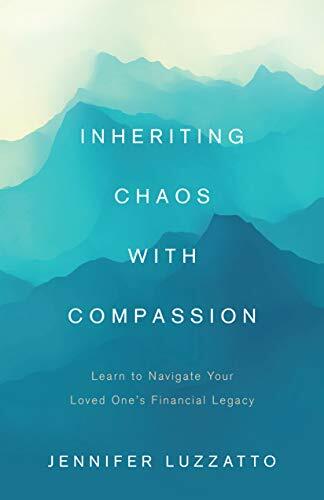 Jennifer Luzzatto, author of Inheriting Chaos with Compassion,has actually experienced this firsthand and is here to give us her expert advice to help you handle the new financial responsibilities in the wake of a family member’s passing. 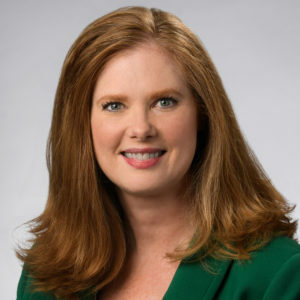 Jennifer also has three decades in the financial services industry, so she definitely knows her stuff. Get Jennifer’s new book Inheriting Chaos with Compassion on Amazon. Jennifer Luzzatto: It really started when my husband was diagnosed with leukemia. I wasn’t thinking about a book at that point. Through that whole process, I really got a front-row seat of what life is like when somebody has a real illness. When people talk about someone else having cancer, we all feel sympathetic and we’re sorry. To really be right there and watching it and living it, it is amazing how difficult it is on people. It’s not even really so much the chemo and the drugs, although that can be pretty bad. He went through a phase where it was really awful. Just the emotional toll and the toll it takes on your schedule and your family. It started with that, really getting a much bigger understanding of how that works and just watching the sea of suffering around you when you’re in those cancer centers. Then after he died, he died suddenly. We were in the middle of moving, and we weren’t expecting him to die. Then it was just a year of trying to pull all the pieces together. A lot of the financial part of that wasn’t too bad, because I have a pretty good understanding just because of what I do for a living as a financial advisor, but it’s added on top of those other things you’re dealing with, like helping your children deal with it. There are other people around you affected by it. You have to support. You have to keep working. You have to keep running the household. It’s hard. Then when my sister died, and that was unexpected, I was thrust into the situation where I didn’t know anything. I didn’t know anything about her financial life. Her husband needed pretty much to quickly go to some memory care unit, and I was left with chaos to pick up the pieces. I was working through that, and I’m still not quite finished. I kept thinking to myself, I even understand all these issues. I understand the paperwork and most people don’t, because that’s not what they do all day. It’s still monumentally stressful to get through it all. The concept is to help people take a step at a time and try not to be quite so overwhelmed. Try to point them in the direction of other professionals that can help them when they need it. Sometimes they will need more, sometimes they will need less. It’s a pretty painful process to try to pick up pieces, especially if you are walking in cold. It was really to put that support and hopefulness out for other people. Rae Williams: What would you say is the first step, both on the financial side and the mental preparation side, when something like that happens to you? Jennifer Luzzatto: There’s two parts to the financial preparation. If you have any warning, just start to pull information together. I found it very helpful with my husband. I already knew what all the pieces were. With my sister, I didn’t know any of them, and it would have been a huge help for them to have had some level of organization. In their case, I had to pick through the mail, watch what showed up, start asking questions. I literally started with nothing. On the mental side, it’s tough because you’re grieving, the people around you are grieving. Often, people are leaning on you as well for support. One thing I think I didn’t do very well that I would encourage other people to do is the way that I function is when I’m overwhelmed, I need a little time to myself. I didn’t really claim that. I was relieved anytime I got 10 minutes where nobody was talking, looking, or anything. I would say whatever helps someone process what they’re going through, whether it’s to be alone for a little bit, or to talk to somebody that’s going to just listen that they trust, would be really helpful to start to download some of that stress and grief. Rae Williams: What is the most difficult part of organizing and managing somebody’s finances after they pass away? You feel you’re in this whirlwind of information. It’s hard to get started, because when you stare at all of that at one time, it’s overwhelming. The hardest part I think really is trying to take that first step and tell yourself, “I’m going to deal with this one thing and try to get it done.” Sometimes it will spawn something else to get done. Just deal with one piece so that you don’t overwhelm your emotional self at the same time. Rae Williams: Is this advice that you generally give to your clients, and how do you bring in the use of a professional when you’re doing this? Jennifer Luzzatto: It depends on the piece. With clients, if they’re new, I’ll tell them just to bring in everything they have and we’ll start to work through it. I act as a guide. I can’t really do it all for them, but I can help make sense of the paperwork and help create a plan of action of what we’re going to tackle in what order. We try to keep it as simple on their side as possible. If they’ve already been a client, we generally already know what all the pieces are and we’ll provide the paperwork and help get that process going for them. I actually just had a client die two weeks ago, and we’re working through with her errors to get them straight, as far as making distributions. In that case, it’s actually a lot easier because I am already familiar with what the pieces are. As far as what professionals to use—an estate planning attorney can help with the legal issues, as far as probate. Sometimes people haven’t died though and you need a power of attorney and somebody to step in, which is what I am for my brother-in-law. We had to get the documentation set up that with him, he was her executor, but he is not mentally able to do it. His memory just isn’t good enough. Address all those legal issues, because once you tackle the financial side, you need to prove you have the authority to act on someone’s behalf. You also need to, depending on how big the estate is, report to the commissioner of accounts that the estate was settled properly. An attorney can help through a lot of that estate, and sometimes they’re para-planners. Their staff can also help you deal with the paperwork for reporting to the commissioner of accounts. I mean, there still have to be tax returns done, right? If they have a CPA, it’s really valuable information if you already know who people are working with, but you want to get all that information to the CPA early the following year, so make sure everything’s reported properly and paid properly. Those are the three main: financial advisor, CPA, and an estate planning attorney. How much you need to lean on each or any of those would really often depend on how confident someone is feeling about dealing with any of that on their own. Somebody might be confident doing the tax return themselves. I personally felt much better about having a professional doing the taxes. Of course, nobody can do estate planning documents legally, except for an attorney. That’s definitely a needed person to have that you trust and know. Rae Williams: I want to make sure that everybody has a whole picture of what some of these things are. When you say power of attorney, what is that and why is that important to this scenario? Jennifer Luzzatto: Power of attorney allows you really to act as though you are someone, depending on how broad that powers are. In the case of my brother-in-law, I have the ability to make all financial decisions for him. I can sell his house, which I did. I could open a bank account if I needed to, close a bank account. I’m literally standing in his gap financially. Obviously, you want to only name someone you really trust as power of attorney, but it allows that person to take care of the business that you probably can’t do at the moment. A power of attorney is for someone who’s living though. Once the person for whom you have power of attorney dies, the power of attorney dies with them, and you or somebody else would become their executor, which is a different function. RaeWilliams: Are there any other terms that you think are very important to know and just pay attention to in a process like this? Jennifer Luzzatto: I mean, executor is probably a pretty well-known, probably doesn’t need the definition. This is more of just keep your head up about it, because I think most people know what a financial advisor is, but they function very, very differently from a wide range of selling insurance products to working on an hourly basis for advice. I would be careful and talk to a few people as far as a financial advisor, if you do not already have a relationship that you trust, that the person you’re talking to really is a fiduciary, so they are legally required to act in your best interest and have an understanding of the industry. I’ve had clients who’ve gotten advice to be invested in some products at a time when they were vulnerable from grief and just felt they had to make a fast decision. It was a mistake what they ended up purchasing. I fought this a little bit myself—I felt I just needed to get it over with. I also knew I needed to take my time and make the best informed decision no matter what it was. I think that’s one of the things that probably a lot of people would struggle with, because it’s painful to deal with. We just want the pain to end, right? You can’t do anything about the emotional pain, but you can get this monster of a project you have over with. Definitely take your time, talk to people, make sure who you’re talking to you really feel comfortable with and meets that fiduciary standard. Rae Williams: What are some of the things that we can do ahead of time to prepare to make the other side of this easier for our loved ones and the process just a little bit more smooth? Jennifer Luzzatto: I think the best thing—and I’m forcing myself to do this, because I don’t really especially want to do it either. In one place, have your will and any other legal documents. For example, I do have an active power of attorney, so if I was somehow incapacitated, that person could step in. I’ve got those documents done, and I need them in a place where the person who could use them could find them. I’ve also interestingly enough started taking copies of my bills and writing—just keeping a copy in there so someone if they had to step in and pay my bills, they could see what my normal commitments are and my login and password, if those are necessary for that. Just lay it all out there. Nobody ever has to see it, they just need to know it’s there. The other wild and crazy thing was all the keys that we found at my sister’s house. I don’t even know how many, that we were like, “Well, where’s the key for this?” You have to dig through the whole big bag of keys and trying to find it and then you couldn’t. It wasn’t in there. Having that, like here’s my front door key, here’s the extra car key, all of that just would make the next person’s job so much easier, because it’s so stressful to dig and look for information. Rae Williams: What happens when people don’t put these things in place? Jennifer Luzzatto: Well, it just adds so much more stress to the situation, because you’re not only trying to take care of things, you’re on a bit of a not very fun treasure hunt of trying to find what missing pieces are. It just makes life smoother for whoever was trying to help. It’s really the kind thing to do to get as organized as you can. Maybe it isn’t necessary for 20 years, but it still is the kind thing to do when people are reeling, not to hand them a big mess at the same time. It’s going to happen at some point to all of us. We’re all going to die at some point. It would be a gift to others to do what you can to make the cleanup in the process easier afterward, so that they have more capacity to process the emotional part. Because the emotional part’s happening simultaneously. There’s a ton of bricks on top of you while you’re trying to deal with both. Jennifer Luzzatto: It comes in in a couple ways. I mean, clearly before someone dies, it is good to have a handle on all of that and what they can sustainably spend during their lifetime and not have to worry about short-term market fluctuations and the impact of different decisions will have. In the book, we really talk about it more. I really talk about it more from a perspective of often what one inherits is not what is going to be the best for the person who inherits the assets. It’s really getting to the point of making the transition between we’re going to get things where they’re supposed to go. Once they go, is this right for your own financial dreams as the benefactor of those assets? We have this tradition somewhat in our country and it’s probably true in other countries, but we tend as investors to have a very narrow focus on the stocks that we buy. For the most part, it can be not optimal. It’s all right, you’ve got things divided up, now what? Now how is this going to be better for you, and how does it fit with your own dreams and aspirations and goals and hopes for how you want it to support your future, or even your children’s future if it’s money you think really you will never use? It’s important to take a look at the suitability and whether those investments are right for you. There’s an emotional component to inherited money that is unique. That is there is a tendency among some people to feel they can’t change what they’ve inherited, because, you know, Dad believed in Ford stock, so we’re going to keep Ford. Or that they just feel guilty spending the money. I’ve had clients who just like, “I’m not touching it. I just can’t. I’m afraid to spend it.” It’s helped walking through that. There are some people I’ve never been able to convince that it’s okay to spend it. Money’s really a tool, right? The value of the money is really what it can do for you and your loved ones and how it can build a rich life for you. I don’t mean that by spending extravagantly, but spending it intentionally. Inherited money just has another twist to it emotionally than other savings that we have. I guess to wrap that up really and help yourself not feel you can’t change things just because it happened to be a stock that your grandfather, or parent bought. There’s nothing wrong with making it fit you, because that’s why they left the money to you. Rae Williams: What are some of the moments you’ve had with clients where this advice pays off and there are breakthroughs and it helps in the healing process? Jennifer Luzzatto: I talk about this story, this particular person—her name is Bethany in the book—who I started working with years ago when her aunt had almost all of her assets in one hotel stock. The hotel was bought out, and all sudden, they had this big chunk of cash. The hotel stock had been bought, I don’t know, maybe 40 years before. A long time. She came to me with her aunt. She was her aunt’s power of attorney, so she could make decisions for her, but the aunt was involved in the relationship as well. We were able to build a portfolio, speaking of investments that would support the aunt’s long-term through her declining health, which was a good I’m thinking eight or nine years. It was a while, so we needed to structure the portfolio so that would support her as she moved through higher levels of care. Bethany, as we call her, so much fun to work with, and she took good care and made sure that all the bills were paid, things were taken care of. She worked hard on that. Because we had restructured the portfolio to something that would support those long-term distributions for the aunt, there was substantial money left over at the end. That wasn’t the purpose necessarily. We wanted to make sure the aunt was taken care of. Bethany was beautiful. She always made sure her aunt had everything she needed. There was definitely no selfishness involved in decisions that were made. It was a tough job for Bethany, because she lived in a different town half the time. She’d come back and forth and really make sure things were okay. In the end, she had a pretty nice inheritance out of that that also made sense for her, because the investments were already set up in a manner that would support her long-term goals and visions and dreams. That’s one. Another one is in the book, where I have a client who started working with me before her husband died, but he was ill. They had no idea what his time horizon would be. It was a degenerative disease and it could have been one year and it could have been 15 years before he died. We consolidated and got it organized because they had various accounts in different places. We helped simplify that part of their life. They had already simplified their home life, sold their house, moved into an apartment, kept things as simple as possible. He died much sooner than any of us expected, so we already had it put together for her. Then we started talking about after a little while, right? Because at first, you’re just blown away by the emotional bomb that just happened in your life. Then after time—all right, what do you enjoy? What are the things you couldn’t do when your husband was ill? Start to envision what her future could look like, because it’s a tough loss. Much of her day had been consumed with caring for him, especially in the last year and a half. She’s really slowly made this great turn towards getting involved in things that she hadn’t been able to for a long time. That’s led to her making new friends. When you’re organized, it gives you a lot of freedom to pursue other things that will bring you joy later, which sounds horrible when you’re talking about joy in the face of death or disability. With time, you figure that out. You figure out what your new normal is going to be and what does bring you joy—and it might be different than what it was when you were married, or in relationship with whoever it was you lost. Rae Williams: What is one thing that you would challenge your readers and our listeners to do that can help before someone passes away or even afterwards? Jennifer Luzzatto: I think it would be the notebook challenge, the one I’ve given myself. Pulling as many things you can think of together and have it in a concise place. Like everyone else, we’re all so busy. It’s just crazy. I just do it one piece at a time. The one thing I’m putting off is going to the hardware store and making keys. Copies of keys. I will admit that one. It’s pulling all that together. If you can just pick one thing a week to put in there, and as you put one thing in there, often it will spark an idea to put something else in there. If you do one thing a week, after a year you’ve made amazing progress at that. The idea of pulling it all together at once is too overwhelming. I would say start with a notebook and start with the first thing you can think of, and then just try to add one thing at least a week or two. Rae Williams: How can people contact you if they’re interested in knowing more, getting more information, just asking questions? Jennifer Luzzatto: My e-mail address is jennifer@summitrva.com. My number is 804-290-0162.